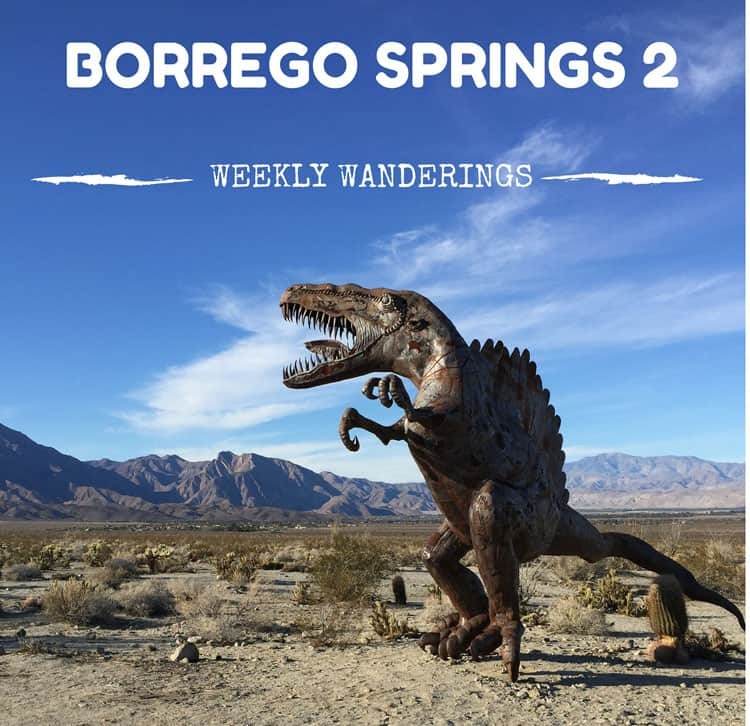 Yes, it is odd to have rusted dinosaurs randomly placed around a town, but that’s what we’ve got at Borrego Springs! Dinosaurs, saber tooth tigers, wooly mammoths, velociraptors on top of the horses, turtles, camels and bighorn sheep. All created by the late Ricardo Broceda. Makes for fun photos. During our second week in Borrego Springs and the second week of Project Escape, we have visited all 28 sky art pieces in the area. We even did a moonlight photo shoot in front of the serpent thinking the moon and stars would make a great background. However, the moon was so bright, the photos looked like it was either sunrise or the middle of the day! We are still looking for the best location for February 5th when the Milky Way is going to be gorgeous. It has been thrilling to see so many stars each night, I can’t wait to see the Milky Way. Last weekend we went on a supply run to San Diego. We were dying for fresh vegetables. The ones in the two tiny markets they have in town are very, very sad. On the way, I saw TWO bobcats! 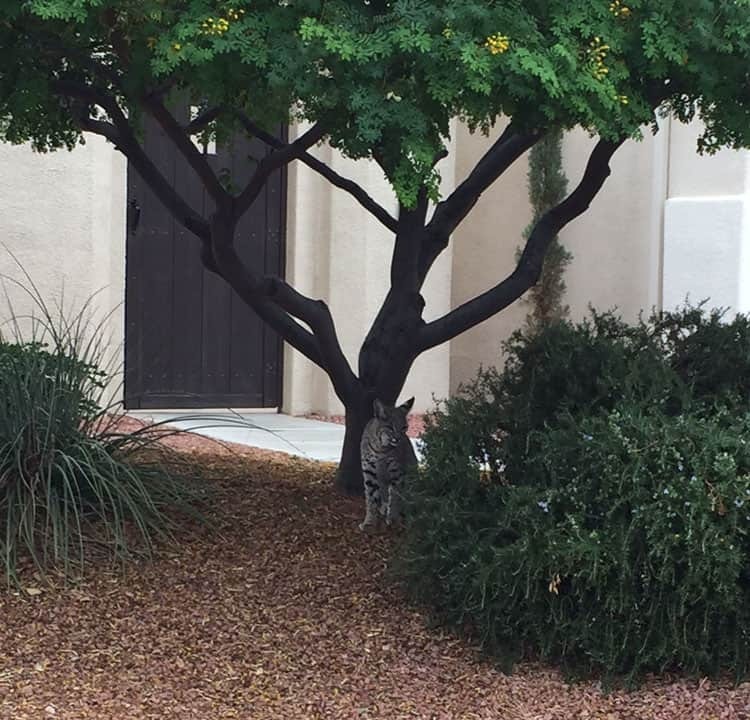 I am now calling myself the bobcat whisper. I have seen three in as many months. Mr. Misadventures and I saw one cross the street in front of us while driving in my parent’s neighborhood. It casually planted itself at a bush and sat and watched us. In San Diego we hit Trader Joe’s, Vons and Ikea. Jessica appreciated our Ikea purchases. Her and I have been fighting for the lush area rug ever since. The few things we bought definitely make our space more homey. I also shared our workspace on Instagram. Until I can get Mr. Misadventures to take photographs of the inside, the iPhone photos are the best I’ve got! 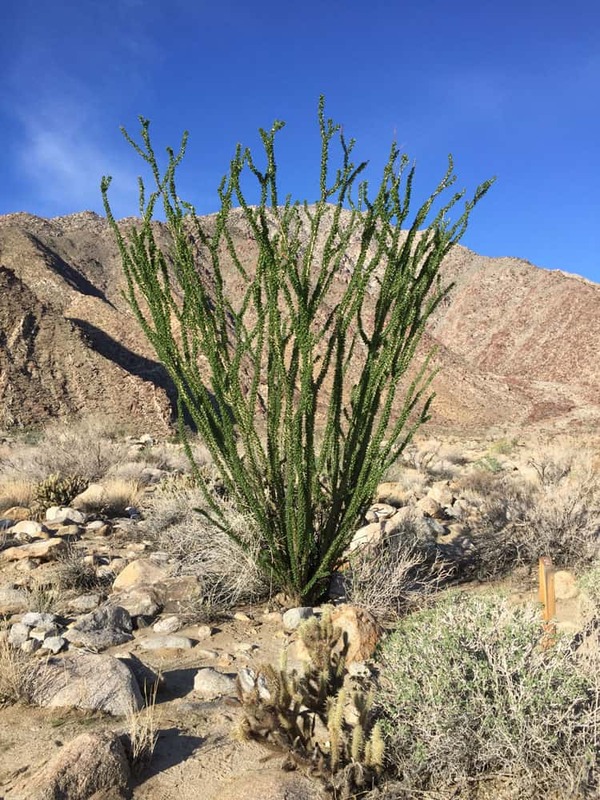 We have visited the majority of the accessible parts of the Anza-Borrego State Desert Park. Most of it can only be reached on off-road routes, or washes, and you need a good 4×4 to use them. We bought a very detailed map, but even so, there was one wash that we only made it half-way through and turned around. It was just a little to advanced for us. When I am looking straight up at a pile of boulders we are supposed to ascend, I call uncle. The other mishap was getting lost. 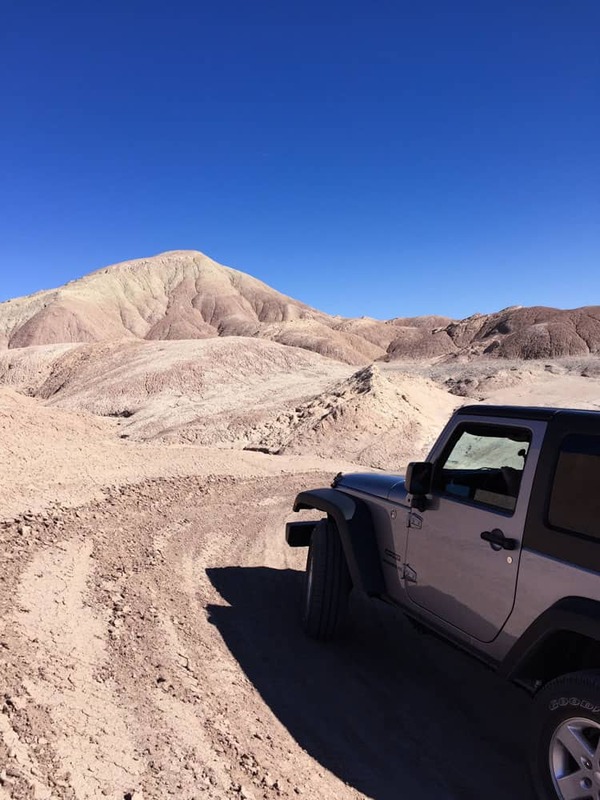 Not our fault, we followed the map perfectly, but something must have happened – weather, winds, because the wash just ended into a dry river bed and we had to find an alternate route out. That led to sand dunes, which led to about 15 choices of tracks to follow to “get out.” We just kept a certain spot in our sites and kept the Jeep in that direction. We had been scouting for a sunset shot so thank goodness we did this mid-morning and not actually at sunset, getting lost in the dark in the desert would not be fun! We did a nice little hike on Palm Canyon Trail, the spot where we’ve been told we can see bighorn sheep. We didn’t spot any, but it is a lovely trail with a spring at the end and we had fun stopping and talking to other hikers along the way. This trail is really great for families. One thing to note, if you or any family member are allergic to bees, it is probably best to avoid this one. There are several bushes that were full of bees, they weren’t interested in us at all, but sometimes you don’t want to take the chance! It has been amazing to see what a difference a week makes in terms of vegetation. The ocotillo plants were dry as a bone, grey, stark with nasty needles, this week they look like this! I am not sure if it is global warning, etc. but the spring bloom normally coming in March, might be early this year, which excites the hubby as it makes for great macro photography. We’ve got one more week here in Borrego Springs before heading to Santa Fe. The landscapes in the US just amaze me, I’ve never experienced a place that looks like Borrego Springs as Ireland is so green and lush. The dinosaurs and other scupltures would definitely make for a fun photo session. It looks like something from another world. Love it! @FiNi, it does take a while to get used to, but there is definitely beauty in the brownness. I can imagine if someone see the wonderful green rolling hills of Ireland they think the same about that glorious landscape. @Katie, it is the calm before the storm, you are going to get busy with all your WITs stuff! IN SF they have closed down Market St until after the Super Bowl 2/7. The NFL have put up a tent city at the Embarcado and filled Moscone Center with events for the week. Also the evening news is being co hosted by Joe and Jennifer Montana! No you are not missing much here except a huge hassle getting in to the city to go to work! @Julie, I see all the photos from my ex-colleagues feeds. The bank I used to work for is right in the middle of all the celebrations – looks pretty cool, but I am glad I am not commuting in that! It reminds me of old western films. NIce. I hope I’ll be able to go there one of these days. @Tyler, it is a great spot, lots of variety when it comes to things to do. I love the dinosaur statues, those are so much fun!! What an amazing adventure you guys are having and all the stories you have. I think the scenery in the southwest is beautiful and always so many fun things to see. @Tammilee, I have to agree, but it wasn’t always the case, my hubby loves photographing the desert so much and it has grown on me. We do need to get out by summer, because I can’t take that much heat! Sounds like quite the adventure especially with the bobcats! @Danielle, it has been fun! @Donna, thanks so much. I will have to check into what the bobcat being my totem means! Now this is a place that I would love! It looks amazing! I haven’t been to this part of the world yet but I’m really looking forward to it a lot. @Susan, how cool that your son works with exotics – there is so much education needed around these animals, I am glad your son is working to spread that message. @Tiffany, they are just like big cats, it was fun watching that one in the field stalk, just like my cat when she is playing, but I would not want to come up alone with a big one! @Vidya, it definitely a sign of global warming which is worrisome. Desert scenes always fascinate me because they’re so foreign to my experience (living here in Florida). Someday I will have to visit a place like that! My hometown has an old garden with dinosaur statues and the one you pictured here reminded me of that old attraction. @Katie, that would be quite a culture shock from the lush greenness to the stark desert, but it is definitely worth seeing in your lifetime. I’ve finally made a final decision on my bachelorette party location – San Francisco! I can’t wait to see your pics of the Milky Way! @Murissa, thanks so much, the adventures are just beginning so I hope you continue to enjoy them. You are busy, but it all sounds fun! This looks so cool and other-worldly! And two bobcats…wow! We saw one in Bodega Bay but it was in a fairly remote area. @Jenna, they are pretty cool when you come across them. I’d love to see a mountain lion, but I don’t want to be too close! You definitely caught my attention just with that first paragraph. That all sounds awesome to see! I definitely would also love to come across bobcats! What a cool place to visit. It is one of my goals to head to the west coast and do some exploring. I have never seen sights like this before, and I truly would love to see some dinosaurs! 😉 I know it would totally make my kiddo excited to see them in the “Wild. @Krystal, you must, there is so much to see on the West coast and the climate is pretty mild all year so you can come whenever! Nice bobcats! And the dinosaurs too, but the bobcats are living so +points to seeing them. Can’t believe I’m living in the PNW and haven’t spot any big cats yet. @Hung, you have a chance for bears too!